The realization hit that Team Honda's Rick Johnson, suffering from an inability to grip with his left wrist and also losing feeling in the middle of the races, would have to retire from professional motocross. Johnson, who first injured his wrist on March 5, 1989, at the Gatorback National in a practice collision with privateer Honda rider Danny Storbeck, had scratched from the February 24 Atlanta SX, electing to stay back in California to have the wrist examined. "From a safety standpoint, it's okay if he doesn't race," Honda's Gary Mathers said. "There's no sense in getting anyone hurt." "We would like to keep him for public relations," Honda's Dave Arnold told Cycle News. "He is the best spokesman for our team." With that, the record book closed on Johnson's brilliant career: seven major titles, 28 AMA Supercross wins (the all-time record at the time) and multiple motocross, Trophee des Nations, and Grand Prix MX wins. His last race entry in The Vault is an eighth place at the 1991 San Diego Supercross. He was 26 years old at the time he retired. The Ryans—Villopoto and Dungey—rode into Atlanta's Georgia Dome tied for the points lead in Monster Energy AMA Supercross, as each was vying for what would be the first 450SX title for either of them. In Atlanta, Dungey was leading near the midway point with RV in pursuit when the Kawasaki rider crashed, his bike cartwheeling in the red clay. When he got up, Villopoto couldn't get restarted, as his silencer was packed with dirt. He would finish the race 19th, picking up just two points to Dungey's 25. Finishing second and third were Honda teammates Trey Canard and Davi Millsaps. Three of the top four riders in the Lites class were foreign imports, as Frenchman Christophe Pourcel won, with Suzuki-mounted Austin Stroupe second, Australian Brett Metcalfe third, and Scotland's Dean Wilson fourth. Some Florida Winter-AMA action of Mike Hartwig, back in 1974 at the old Jacksonville track. The FIM Motocross World Championship began in Losail, Qatar, and Tim Gajser (MXGP) and Jeffrey Herlings (MX2) were the big winners, sweeping both motos of their classes in a nighttime race held under the lights. Kawasaki Team Green off-roader Danny Hamel won the AMA National Hare & Hound Series in Lucerne Valley, California, topping his teammate Ty Davis by four minutes at the finish. Dan Richardson finished third on a Honda. Kevin Windham won the Dallas Supercross at Texas Stadium in Irving, topping Suzuki's Larry Ward and his Honda teammate Michael Pichon. Defending champion Jeremy McGrath, suffering from the flu, finished fourth on his Yamaha. Team Kawasaki's Ricky Carmichael finished 19th after a crash. Pro Circuit Kawasaki's Nathan Ramsey won the 125 class over Yamaha of Troy's Casey Lytle and Suzuki-backed David Pingree. 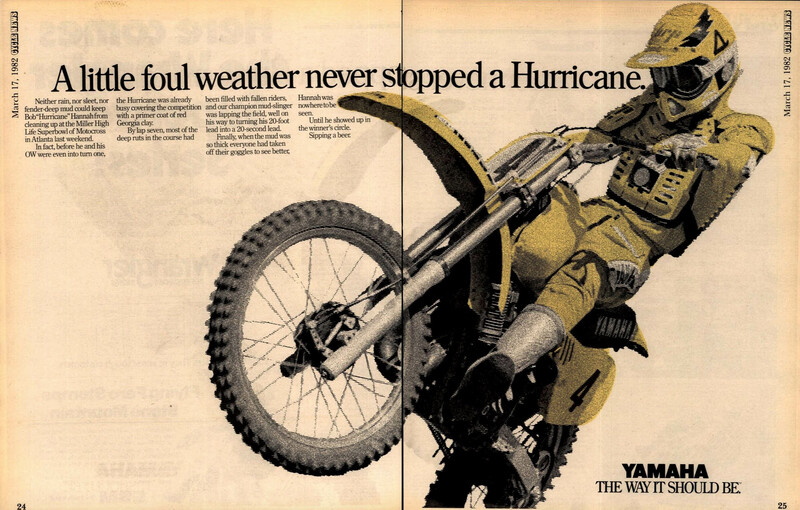 Bob Hannah won an AMA Supercross on a Yamaha for the last time, taking the win in Atlanta ahead of Team Honda's Donnie Hansen and Darrell Shultz. Ironically, Hansen and Shultz would go on to win the AMA Supercross and 250 Motocross (Hansen) and 500 Motocross (Shultz) titles that year, but neither would be racing in 1983 when Hannah moved over to Honda. Hansen would suffer a career-ending concussion toward the end of summer while Shultz would stop racing after the '82 season. Making his debut racing in Europe, KTM's Mike Alessi went 5-3-5 at the International No Fear MX event in Pernes les Fontaines, France, which was good for fourth overall. The race was won by New Zealand's Josh Coppins.